And here's a sweet story for Valetine's Day. 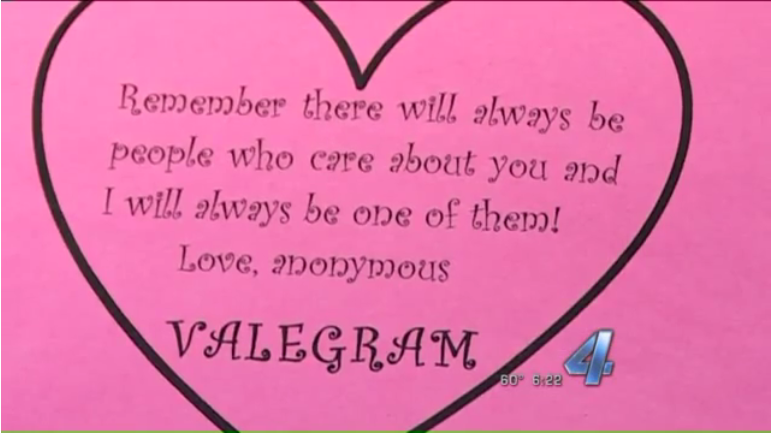 An Oklahoma boy made it his mission to make sure there were no lonely hearts at his high school this Valentine’s Day. Student Dan Williams secretly surprised all 1076 girls at Edmond High School on Friday with cards and candy. Williams’ random act of kindness was supposed to stay a secret, but eventually word did leak out about the true identity of the school’s secret Romeo. Students created a giant “thank you” card for Williams on campus. Williams told KFOR that he worked all summer to raise enough money for his Valentine’s Day surprise. “To know that someone cares about them, that the best feeling in the world I think,” Williams said.